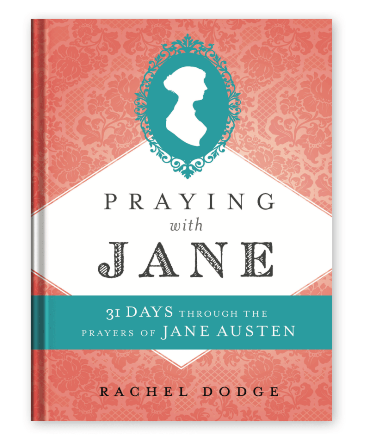 my friend, rachel dodge, releases her book, Praying With Jane, today! while we are new friends, i’ve walked the whole journey with her from the creation of this idea to the surrendering it to the editor and all the in betweens. i’ve listened to rachel pray. i’ve seen her pour her heart out in this book and watch her trust God with what He has in store! i’m always inspired by the sweetness she shares with God. she really has that aroma about her! it’s my delight to have her here today. she’s going to talk about prayer, her book, and how her prayer life fits into the message of my upcoming book! please welcome my friend, rachel dodge. and after the interview, enter to win her book in the comment section below! Me: Rachel, prayer is strong within you! It’s a discipline you have nurtured. For those of us who are new to faith in God, are in a dry season, or are here to learn, tell us how you pray? The daily-never ceasing-consistent-always talking to God-kinda prayers. I see God always in my thoughts. But there’s a difference between knowing God is with me and actively communing with Him. It’s a conscious effort - to ask the Lord into my thoughts and my to-do list, things I’m thinking about, people I’m concerned with. To take these thoughts and lift them up to God throughout the day while I’m doing chores, writing, and teaching. It’s a steady communication that I’m mindful about inviting God into everything. 2. Set aside-extended times of prayer. For the most part, this is a regular part of my mornings. I start the day with my Bible reading. Sometimes I get to pray then too, but with my family, there are times when I get my Bible reading done and prayer happens later on. It’s also a regular part of my evening routine as I get ready for bed. I don’t do any of this perfectly, but I get on my knees and pray about all that stuff that’s still heavy on my heart at the end of the day. It’s good to get it off my shoulder as I close out the day. Me: What are benefits to a praying life? What did you see in Jane Austen’s prayer life that we can learn from? Rachel: For me, prayer is the most vital part of feeling close to God. Everyone wants to know He is near. The two ways I mentioned to the previous question help me feel close to God. I feel like I know Him better and that He knows me and that we’re sharing the day together. There’s a fellowship that comes from prayer. He gives me eyes to see situations. He takes my burdens away. A life of prayer draws us close to the heart of God and we get to understand how He works and gain His perspective that we can’t get otherwise. Another benefit from consistently spending time with God in prayer, is that more of our hearts are open to Him. The more still we can be, the more our minds start to calm down. We can hear Him. Yes there are times when I receive immediately from Him as I call to God in prayer, but for the most part, it requires a stillness in His presence. And that’s certainly a benefit! A new way I’m praying these days is because of what I’ve learned from my writing this devotional book, is writing out my prayers. I’ve been doing this consistently and daily this year. I used to write down these thoughts in the margin of my Bible. Now I have a prayer journal and I write out everything that’s on my mind. I write out Scripture verses and I pray those very verses in my prayer time. While I strive to develop this discipline, I really am liking this way of praying. Me: What does intercessory prayer mean to you? Rachel: I’ve studied and taught on this subject alot. It’s this wonderful action we can take to partner with God. To intercede is to come on behalf of someone. It’s such a beautiful picture of coming to God and presenting requests that aren’t for ourselves but for someone else. The Lord is going to touch that person because we took action to pray. One of the coolest things for me, is praying often for someone who is ill, often on my knees, and then I sense in my spirit that God has released me and told me to get up. That He has heard and He has answered! I want to be very specific when I pray for someone. “Lord, I pray that You will make a way for this person to know Jesus. I pray that You will open their eyes. I pray you will bring people into their lives who will speak truth.” And things like that! Another amazing thing is that we get to help them and we never know what will come from it. We might not ever even see it! We get to be a part of this amazing spiritual ministry of bringing them before God Who has the power to help them with anything. When someone is struggling with something and we feel helpless, we feel like our hands are tied. But when we intercede, our hands are not tied! As we pray for others we are bringing them to our glorious Creator Who works miracles! He is a God of redemption, our Comforter, our Counselor. We get to pray for people that no one else is praying for! I’m praying for my students in my class, students in my kid’s classes. My husband’s co-workers. Friends that are closed off to Jesus. Maybe someone else is praying (awesome) and I’m #2 or #9! But it’s an exciting conviction that I’m doing something for someone that maybe hasn’t been touched by God before. Intercession is a partnership with God! Me: You’ve been right along with me as an intercessor through my book journey the past 18 months. You’ve read through my early proposals and manuscript submissions. What you write about is also woven into the message of my book. How does prayer help you love where you live? Rachel: Prayer helps us have the mind of Christ. If I don’t take time to pray, I’m less likely to be invested and will be more into myself rather than others. It’s easy to be wrapped up in our own lives and ministry. It takes prayer to love people and see opportunities around us, to see the people for who they are. If I start to pray for someone, my perspective changes and God gives us insight and His heart and compassion for them. You get invested. I am more invested where I live because I pray. Rachel, thank you. We are to be lifelong learners and participants of prayer. Friends, how would you answer one of the questions I asked Rachel? Let’s learn together. List your response in the comments below. Plus, everyone who comments will be entered into a giveaway for her book, releasing today! Winner selected Saturday, October 6 at midnight pst. You can find Rachel at racheldoge.com and follow her on instagram as kindredspiritbooks. The book available wherever books are sold! Let her know you’re praying for her and the effects of this book today!